For over a year now, Rose City Antifa and our allies have come together to resist the far-right group Patriot Prayer, led by Joey Gibson. In extensively-researched articles and in copious documentation, RCA has made it clear that Patriot Prayer events serve as an organizing and rallying platform for bigots, white nationalists, fascists, and neo-nazis. Recently the tenor of Patriot Prayer rallies has escalated significantly. The fascists and white nationalists who attend Patriot Prayer events always love the opportunity to lash out at anti-fascist activists, and the far-right has actively been involved in demonizing anti-fascism in order to score political points. However, we are now seeing a widespread glorification of violence against not just anti-fascists and the left, but against socialists, migrants, journalists, liberals, centrists, and anyone not swearing allegiance to the dictatorial policies of the current president. Patriot Prayer, Joey Gibson, the Proud Boys, and other so-called Patriot figures have repeatedly called for a wave of violence to “cleanse” the streets of Portland. In any of our articles, you can see that they are not being coy about who they want to cleanse from the streets. They want to “cleanse” LGBT people from the streets. They want to stomp and remove immigrants. They want to assault people of color. They want to punish the city of Portland for its liberal politics. And yes, they want to kill anti-fascist activists as well. They want to murder people in our community, for no other reason than organizing to stop the spread of white supremacy. Their online conversations are filled with disturbing, Turner Diaries-esque fantasies of purges and cleansing the streets of those they deem undesirable. Observing their behavior and rhetoric, there can be no confusion about their objectives. 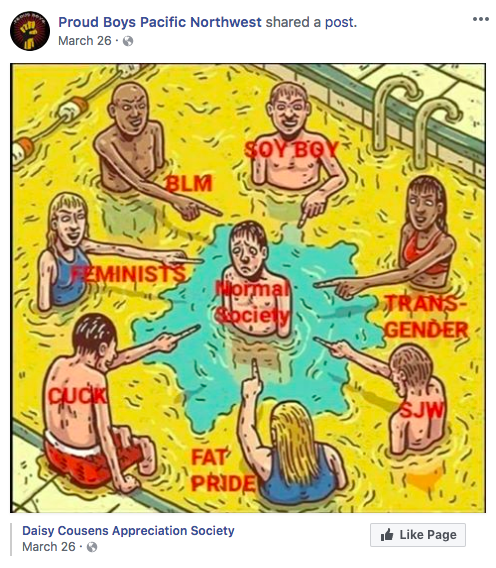 Proud Boys portray themselves as opposed to wide segments of the population. Proud Boy Jake Farmer calls for full blown war in order to purge their social enemies. 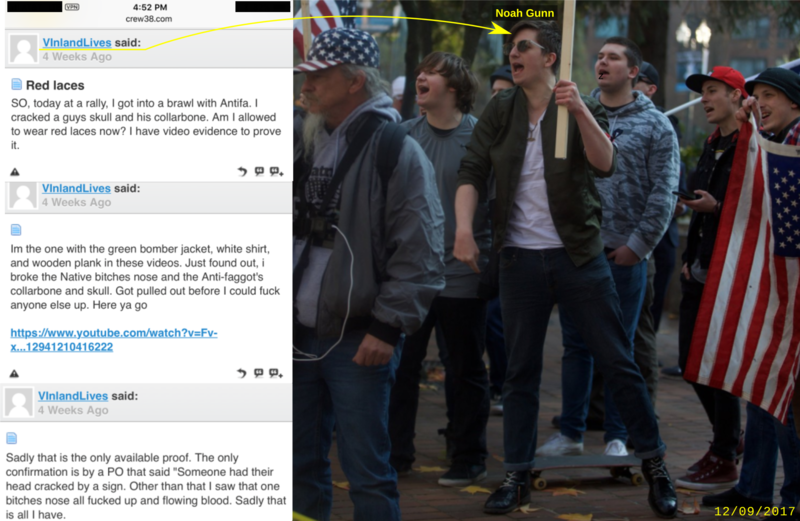 Hammerskins hopeful and Patriot Prayer rally-goer Noah Gunn celebrates attacking a “native b*” and an “anti-f***“. 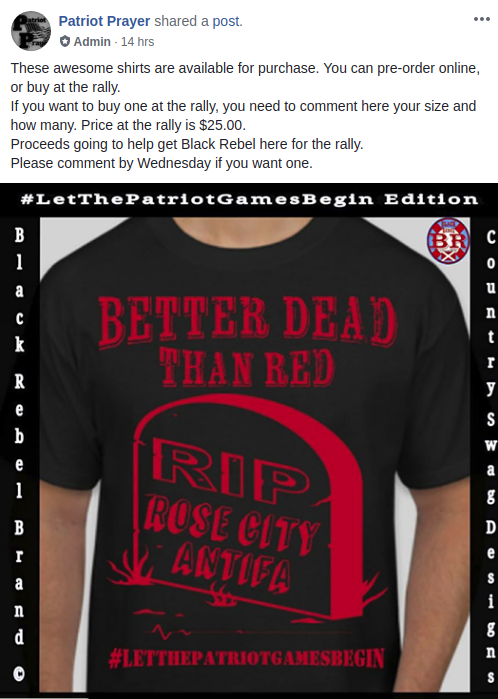 This T-shirt promoted by Patriot Prayer is actually one of the tamer death threats levied against anti-fascist activists. As anti-fascists, we accept the risks. History has shown that militant resistance is a necessary and important tool in the fight against fascism, and victories are hard fought. We make no apologies for the use of force in defending our communities from the scourge of right-wing violence. Our enemies come with the intent to harm and threaten people. We will not dignify their genocidal rhetoric and violent acts with a debate. We will rout them. We are proud of the courage that antifascists showed on the streets on June 30th. We were in a 3-way fight. Outnumbered by both the cops and fascists individually, we still stopped their march. It was a tough battle, but we stood our ground and risked or sustained arrest and injury to do what is right. With your help, our victory on August 4th will be even more desisive. All across the country, the far-right has been calling for a “civil war,” dreaming of an opportunity to fight the rest of the country in the streets. As we look to the month of August, we can see groups like Patriot Prayer trying to bring this idea into reality. After the Patriot Prayer event August 4th, there is one the very next day in Berkeley on August 5th. On August 11th and 12th, white supremacists are attempting to return to Charlottesville and then go to Washington DC, to relive the violence that led to activist Heather Heyer’s murder in 2017. On August 18th, in a series of events across the country, far-right groups are planning to march “against leftist violence,” in yet another excuse to enact more violence of their own. 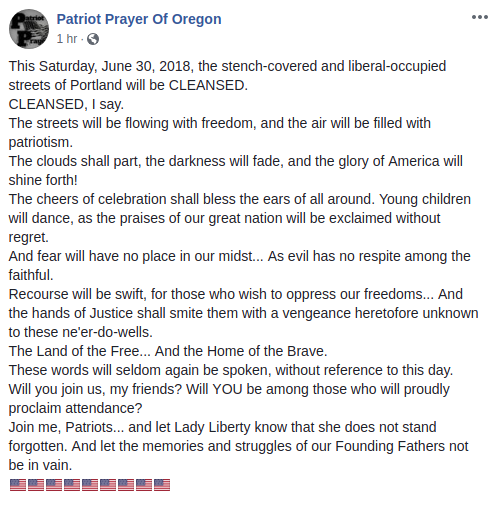 And then on August 25th, Patriot Prayer has threatened to return to Portland yet again. White supremacist violence committed the largest share of domestic-extremist killings in 2017. The wider far-right is now seeking to add its violence to that trend. Rose City Antifa has always been clear that we do not think that all Trump supporters are racist. 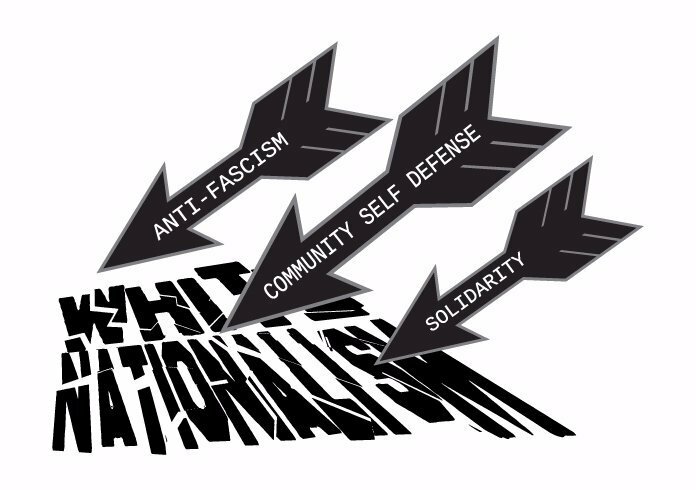 However, as the clearly racist, brutal policies of the administration become undeniable, and as those supporters in the far-right who still feel the need to violently attack our communities on a monthly basis as a “rally” to support the president, we must recognize that the situation has changed. We now face a rising tide of white nationalism. Patriot Prayer, the Proud Boys, and other groups involved in these events want a world where political power is attained by targeting groups for violence. Patriot Prayer is a threat to the community not just because of the fascists they bring into our city, but because they represent a politics opposed to a democratic society, lead by dictators, run on the blood of those deemed weak enough to be rounded up, assaulted, and killed. We will not let our community fall to bigoted tyranny. We will not allow people to be scapegoated so that white nationalists can fulfill their violent fantasies. It has been suggested that if anti-fascist activists don’t show up to far-right events, the far-right will simply go away. The past year has shown that is completely false. Patriot Prayer schedules event after event, regardless of the outcome, because they seek any opportunity to find glory through violence. Their pursuit of bloodshed occurs both inside and outside of events. Proud Boys attack people walking down the street, teens at the mall, and threaten to burn down bookstores. The violence follows the far-right wherever they go. If anti-fascist activists do not line up against them, they will target queer events, migrants, and any other person in the community that they decide is a target. Anti-fascists, and those who stand with them, are the front line of defense against white nationalist violence. We may not be muscle-bound gym rats, and we are certainly nothing like the sadistic bullies in Joey Gibson’s goon squad. Nevertheless, we are willing to physically protect people already under attack in our communities. In an extraordinary historical moment, we are regular people called to do extraordinary things. If you are someone with the capability and the courage to do this work, we say to you: this is the time to act. Be prepared, be smart, but do not be a bystander.